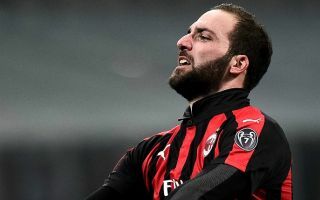 AC Milan striker and Chelsea transfer target Gonzalo Higuain has reportedly handed in a transfer request, according to claims by Sky Sport Italia. The 31-year-old is currently on a season-long loan deal with the Rossoneri from Juventus, although they hold an option to buy him at the end of the campaign for an additional €36m, as detailed by Sky Sports. Things haven’t gone to plan so far this season though, as Higuain has managed just eight goals in 21 appearances with youngster Patrick Cutrone coming off the bench and outshining him by scoring a brace in the Coppa Italia clash with Sampdoria on Saturday. With concerns over his form at Milan, it has led to increased transfer speculation, with BBC Sport noting how Gennaro Gattuso seemingly hinted that Higuain wants to move in his post-match comments. Now, as per Sky Sport Italia journalist Angelo Mangiante in his tweet below, it has been suggested that Higuain has officially asked Milan to allow him to join Chelsea, where he would reunite with former Napoli boss Maurizio Sarri. Higuain enjoyed the most prolific season of his career under the Italian in Naples, scoring 38 goals in just 42 games in the 2015/16 campaign. With that in mind, it’s clear as to why he would want a reunion to rediscover his best form, but time will tell if such a move materialises before the end of the month. It remains complicated due to the details of Milan’s agreement noted in the Sky Sports report above, as they have six months left on their loan deal for Higuain, for which they’ve paid €18m, while they are due to pay another €36m this summer. How that would be affected is unclear as Juventus will want to be paid either way, while Milan would be left dangerously light in attack if they allowed Higuain to leave in January, which could put their hopes of qualifying for the Champions League in jeopardy. In turn, it seems as though many pieces still have to fall into place for a Higuain move to Chelsea to come to fruition, but as per the tweet above, one thing that is reportedly clear is that the Argentine forward wants to join Chelsea. Any move will surely have to wait until later in the week though, as Higuain was pictured by Milan on their trip to Jeddah as they face Juventus for the Supercoppa on Wednesday. The boys are departing for the Super Cup clash against Juventus ?? Si parte verso la #Supercoppa ? ?